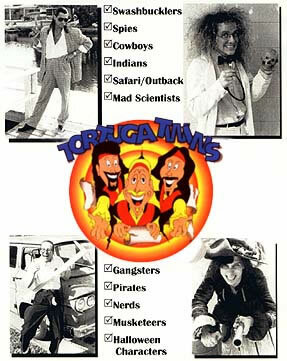 Why Are The Tortuga Twins so important to a successful entertainment venture? The buzzword for the modern-day entertainment production is audience participation, and this is where they shine. They have years of experience in scripted and improvisational comedy. Their special type of "in your face" comedy guarantees to delight audience members of all ages. Additionally, their characters are highly interactive, entertaining both on and off the stage. They make the audience part of the show........... YOU are the magic ingredient. Just a few of the possible show themes: we suggest... "Robin Hood" Audience Participation or "Trunk" Show: Shows in which several audience members get to have starring roles in the production. "The Tortuga Twins' Classic Edwina Show" Interactive Comedy: Shows where the storytellers interact with the audience with hilarious results. "Musketeers Three" Physical Comedy or "Skill Show": Shows involving displays of skill such as swordfighting, juggling, or mime.